A BIG AND SPECIAL DAY FOR CAPTAIN VIJAYAKANTH! 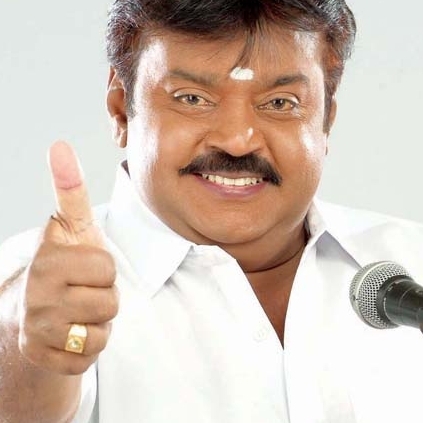 One actor who has tasted major success early in his career is Vijayakanth. Even though he barely acts in any films these days, he will always be remembered for his patriotic and strong roles. He celebrates his 65th birthday today. After debuting in Inikkum Ilamai in 1979, the actor/politician went on to taste some success only after facing a few unsuccessful ventures in the initial stages. His film, Sattam Oru Iruttarai with SA Chandrashekar brought him to the frontline and there on, started his successful film career. He has acted in over 150 films with his 100th film, Captain Prabhakaran, giving him the name Captain for a lifetime to come. He is currently the Founder, Leader, President and Chairperson of Desiya Murpokku Dravida Kazhagam, a political party in Tamil Nadu, formed in 2005. He was the leader of the opposition party during the term 2011-2016 when the late J Jayalalithaa was the Chief Minister. His son, Shanmuga Pandian made his debut with Sagaaptham in 2015 while he produced and made a cameo appearance in it. We wish him a very happy birthday and we look forward to seeing him on screen soon! Post Vijayakanth And Arjun's Era, What Has Happened To Patriotic Movies In Tamil ? Vijayakanth Delivers A Shocker With Regard To The Upcoming TN Elections. People looking for online information on Vijayakanth will find this news story useful.